Home Costa Rica News	Do You Like Pigeons in Your Hospital Room in Costa Rica? 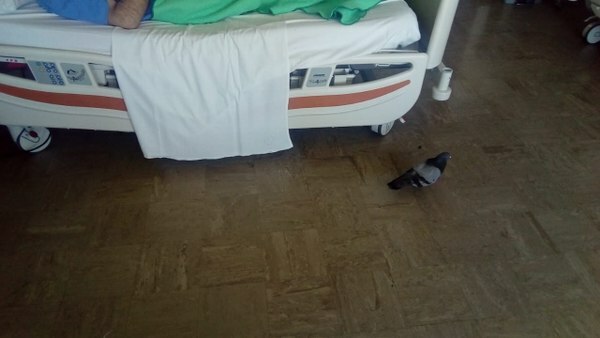 Do You Like Pigeons in Your Hospital Room in Costa Rica? Several patients and relatives took pictures and recorded videos of pigeons in the halls and even in bed with a patient in the Hospital Mexico. These have been circulating social media. This could become a serious problem due to the fact that pigeons can spread an extensive list of diseases. One that they carry is called histoplasmosis. It is produced by a fungus and can cause cough, fever, muscle and chest pain and even pneumonia. The hospital’s director will investigate to see if the videos were in fact from the hospital. He asked patients not to feed birds if they are seen. Previously, the sale of corn to feed birds in the surroundings of the hospital was prohibited. Additionally, he and the press office of the Costa Rican Social Security Fund ensured that the medical center will place mesh to prevent entry of birds. If anyone sees a pigeon in the hospital they should alert the staff.